RJ Thompson has been awarded the Governor’s Award through the state of Ohio for his development of the “City of You” project. The Governor’s Award is given to an individual or organization who develops interactive art participation to bring the community together. Thompson, assistant professor of graphic and interactive design at Youngstown State University, was one of 66 applicants for the Governor’s Award and was chosen for his work in Youngstown. In 2016, Thompson had an idea to bring the Youngstown area together by advertising the area in a creative way. He started the organization “City of You” as part of his mission to make the Youngstown area a more diverse community, which he said provides an outlet for residents to share their stories in the form of about 200 podcasts that show the diversity within the area. 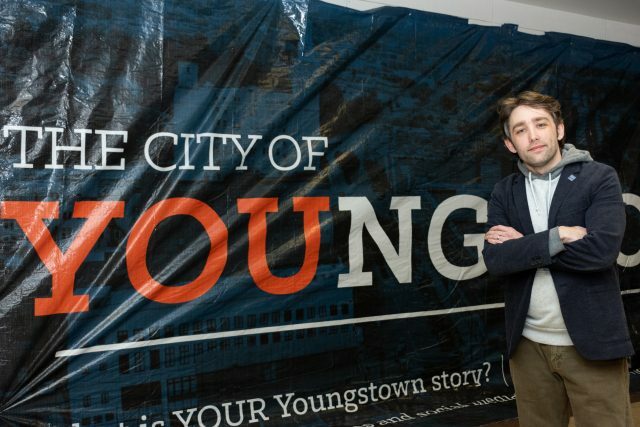 “It is a platform through which all members of the community can be empowered to share the stories of the living, working, playing, learning and thriving in Youngstown — be it as a student, recent transplant, entrepreneur or lifelong resident,” he said. He said other projects have spiraled from the “City of You” project to help the area and certain issues that are happening. Thompson said he felt honored to be nominated for an award at this level. According to Thompson, he was one of the only nominees to represent northeastern Ohio and wants to inspire his students to better themselves through their work. He said he hopes to spread his work and success to other areas of the country. Andrea Minotti, a junior graphic design major, has had Thompson in a graphic design class at YSU. “[Thompson] is truly a great professor who always has the best interest in his students in helping them succeed and grow as designers,” she said. Minotti said the award was well deserved. “He truly cares about the growth and accompaniments of only only himself, but his students,” she said. Michelle Gabriel, a senior graphic design major, has had Thompson for various classes and said the passionate he has for his work transfers into the classroom. “I’m so happy for him for winning the Governor’s Award, I think he’s really earned it,” she said. For more information on the “City of You” project, visit www.cityofyou.org. So proud of this guy. I met RJ years ago when we worked for Prisma’s in-house graphic design team at the Heinz 57 Center in Downtown Pittsburgh. We became fast friends. As the “OG” (old guy) on the team, I admired his drive and enthusiasm. I didn’t find that in a lot of younger designers. His love for graphic design and his energy despite living with CF was inspiring. Anybody who knows me or has worked with me knows my passion, energy and work ethic as a designer, so I know what I’m talking about when I say RJ Thompson has what it takes and Youngstown and YSU is very lucky to have him! Congratulations my friend, you deserve this! Keep pushing forward and keep inspiring your students and the people around “you”!